Best disease, or Vitelliform macular dystrophy, is a genetic eye disorder that can cause progressive vision loss. It was discovered in 1905 by Friedrich Best, a German ophthalmologist. The disease can be detected between ages 3 and 15 years old, although symptoms may not develop until later. 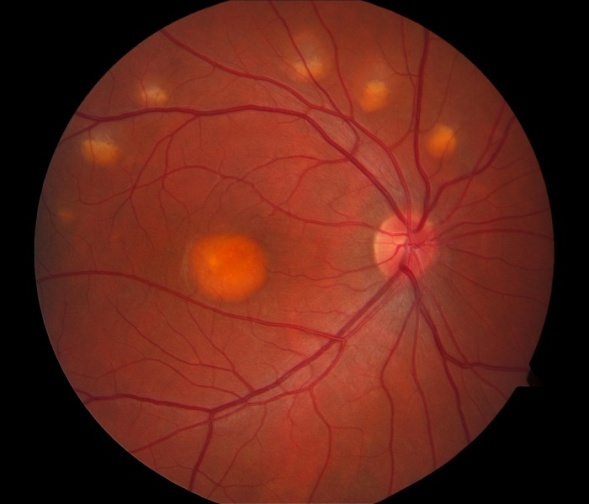 Best disease appears as a bright yellow fluid-filled sac, or cyst, under the macula. The cyst looks like a sunny-side-up egg. Vision may be normal or near normal at this stage. Eventually the sac bursts, and the fluid spreads throughout the macula. The disease occurs in stages over a period of years. In early stages, there is no loss of vision. During later stages, the disease causes central vision loss in one or both eyes. Symptoms include blurred and distorted vision. Central vision may deteriorate to about 20/100 in later stages. Some people with Best disease never progress to later stages and may not have serious vision loss. Others may lose vision in one eye, but not the other. Best disease is genetically passed through families by the autosomal dominant pattern of inheritance. If one parent has Best disease and one does not, there is still a 50% chance that their children will inherit the disease. Children who do not develop the disease can’t pass it on to their children. Ref. Unfortunately there is no treatment for this eye condition at the moment. Although many advances are being made in identifying genes responsible for Best disease, this has not yet led to a treatment.